Hi friends, and happy Tuesday!! Can you believe we are almost through May already?? I know in some parts, Mother Nature hasn’t gotten the memo that spring has come, and summer is almost here. I’ve heard people say that they are still getting freezing temps. That’s crazy to me. We’ve had a LOT of rain lately, and while the garden loves it, and I know it’s “better” than a drought, I’m over all the rain. It makes it so humid and sticky and muddy outside. Compound that with dogs going outside and bringing said mud back inside and…no thank you. But, there isn’t much we can do about good ol’ Mother Nature, now is there? So instead, let’s focus on a very delayed, but totally delicious Taco Tuesday recipe! J and I love salmon, this is no secret. And I love (adore, have a slight obsession with, perhaps) tacos, which is also no secret, so any time I have the chance to combine those two loves, I’m in foodie heaven. 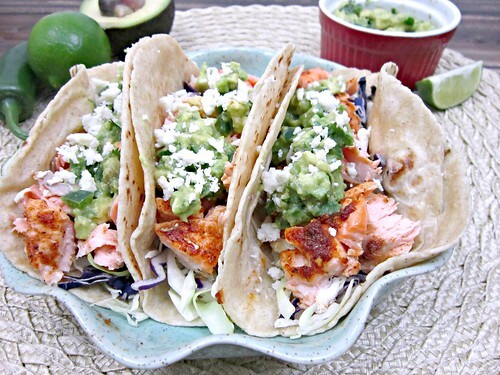 And these salmon tacos are amazing. The salmon is coated with great spices, baked to perfection, and then topped with a creamy avocado salsa. I mean, just look at that salmon!! And I love that the shredded cabbage gives a crunchy texture to what could be all soft filling. 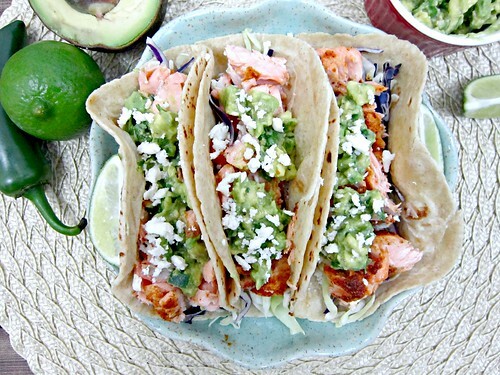 Crunchy cabbage, spiced salmon, creamy avocado salsa, all wrapped up in a tortilla. Yep. I’m pretty much in taco heaven right here. Oh, and cheese. We can’t forget about the crumbled cheese on top! Basically I’m telling you that you need the tacos in your life. Tonight. AND, if it does happen to be warm in your neck of the woods already, you can alternately grill these or cook them in a pan on the stove, instead of turning on your oven, if you prefer! But whatever cooking method you choose, just make them soon! Preheat oven to 350 degrees F. Line a baking sheet with foil or parchment paper and set aside. In a medium bowl, combine the olive oil, lime juice, chili powder, cumin, onion powder, paprika, coriander, salt and pepper. Place the salmon fillets on the prepared baking sheet, and evenly rub mixture over the tops. Bake for 15-20 minutes, depending on thickness, or until cooked through. Once done, use a spatula to gently separate fillets from the skin and place in a bowl. 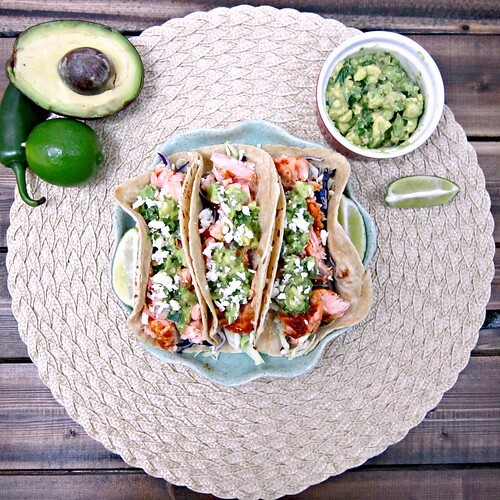 Use the same spatula to gently break the salmon into large chunks for the tacos. While the salmon is cooking, combine the diced avocado, cilantro, jalapeno, garlic, lime juice, and olive oil in a medium bowl. Season with salt and pepper, taste and then add additional seasonings and/or lime juice to suit your tastes. To assemble tacos, warm the tortillas, then top with a layer of shredded cabbage, salmon chunks, avocado salsa, and sprinkle with cheese. Voila! Dinner is served!